Ask fellow campers about "Mar-A-Villas RV Park" and nearby attractions. We stayed for 4 months, as we have for the past few years. The park is a princess with a few warts. Most of the rv'ers stay here all winter for years and years on end, with a few transients passing thru on their way further to the south or back north again. The DIF government facility next door hosts persons of all ages in groups for a few days at a time, and at least once a week they have a dance party, but the (loud) music shuts down about 11 pm. Alfredo, the owner, practically lets us run the park by our selves and only shows up to collect rent or to play pool with his friends, both Mexican and Snowbirds. The beach is fantastic, and extends several km in both directions. Many times you can look up and down the beach and hardly see more than a dozen people. Electricity can be erratically high voltage and the water pressure is low, but of good quality. The two washrooms are used by the rv'ers with small units and are kept (mostly) clean by Antonio, the groundsman. He also makes sure the palm trees are stripped of the cocoanuts before the season starts. This is one of the best parks we have visited in Mexico for ambiance and good neighbors. We camped at Mar-A-Villas RV Park in a Motorhome. Access and sites are very tight for big rigs. Lots of mature coconut palms and bamboo between and around sites. Clean bathroom/showers. No laundry. Beautiful beach at the end of the park, with a shaded area for those who don't want to sit in the sun. Typical Mexican RV park utilities: Some sites had low water pressure, some didn't. 30 amp power would sag under load and exceed 132 VAC occasionally when not under load. Most residents stay for months at a time, and they are all very friendly. The location makes it easy to take a bus or taxi anywhere in town. There can be quite a bit of late night noise from the federal recreational facility on the south side, and people on the north side can have a great deal of noise from the kids playing in the residential area next door. Our friends' site had a trampoline six feet from their bedroom windows. Excellent fee-based WiFi at 385 pesos/month or 200 pesos/week. 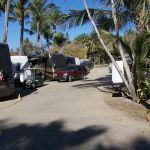 We camped at Mar-A-Villas RV Park in a Motorhome. Are you affiliated with Mar-A-Villas RV Park ?